There’s so much you want to do in life, and so little time. The story of our modern lives. Take a moment and consider how many things you want to learn. Since you’re reading this, for sure one of them is Vim. Now think, what’s holding you back from getting started? It’s hard? It takes time? Effort? Over the years, I learned two uncomfortable truths related to learning. First: skills take time and effort to master. And second: many things aren’t fun until you’re good at them. While learning any skill, there is a period of time in which you’re horribly unskilled, and you’re painfully aware of that fact. The same goes when learning Vim. This book presents my personal quest to quickly learn Vim, and as such, it will help you to acquire new Vim skills in record time. One of the beautiful things about learning any subject is the fact that you don’t need to know everything. What’s important is that you only need to understand a few critically important concepts that provide the most of the value. The same goes for Vim. Mastering Vim Quickly presents a set of fundamental Vim concepts you can use to get things done. Once you master the fundamentals, you can accomplish even the most challenging Vim magic with surprising ease. And you will love it! Over the past few years, I read several books on Vim, passed through hundreds of tutorials and tips, used Vim from few to 10+ hours a day and coded in more than few different programming languages. Along the way, I’ve collected, distilled and refined my findings into concepts and best tips presented in this book. If you invest the time and energy necessary to learn these concepts, you’ll easily be in top 5% of the human population when it comes to productivity in coding, programming and text editing. there’s really a lot out there – use this book to help you what matters the most. This way you can focus on what’s actually important: getting stuff done. I’m a learning addict. I usually read few books every month. This is good, because I learn a lot. Then I try out what I learned, and adopt what works for me. In this short chapter, I will present you the three most important principles which work for me when it comes to learning. Italian economist and sociologist Vilfredo Pareto (1848-1923) observed that 80% of the land in Italy was owned by 20% of the population. While investigating other countries he found the same unequal distribution of income and wealth in each. He published his observations and the math supporting his findings. After publication, researchers in other areas of science and business began to find the same unequal distribution in their fields. That’s how Pareto’s Principle became the name of one of the most significant of universal principles. Pareto’s Principle basically states that roughly 20% of all our actions produce 80% of our results. This means that 80% of effects come from 20% of causes. Because of these numbers, it’s also called 80/20 principle. We know that it doesn’t have to be 80/20. It can also be 90/10, or 70/30. That’s not important right now. What you must know is that 80/20 principle works, regardless of whether you’re conscious of it working or not. This is true for your business, personal life, and everything you learn. Including Vim. This means that, more or less, around 80% of what you’ve done today, has been pretty much worthless to your bottom line. You probably know there are things you should be doing, that you’re just not doing for whatever reason. Maybe you’re overweight or out of shape and you know you should work out more. But, back to the topic. Why am I telling you this at all, in a book about Vim? Well, I truly believe that this principle is true. I use it in almost every important area of my life, and it gives me very good results. I also used this principle to quickly master Vim. This book provides you 20% of the most important Vim fundamentals, which will help you to learn Vim really fast. In order to learn Vim, you need to commit to it. Think of the last time you made a commitment to learn something. Or to change something in your life. It was easy to make a commitment, wasn’t it? Maybe you even had a plan! Then, forward a few weeks. Where’s that commitment? Gone, right? You’re not so motivated anymore. Your willpower is close to zero. I know this story very well. I’ve been there, and done that. I had to read a lot and try out what works to find my way out. And I did! In the next couple of paragraphs, you’ll read the summary. That’s all you need to know. When you commit to something, the best way to reach your goal is to create a habit. In this case, your goal would be mastering Vim quickly, and the habit you need to adopt is to regularly learn. The biggest barrier to forming new habits is usually the fact that it takes discipline to keep doing something you don’t really feel like doing. I found a workaround for this. It’s called the mini habit. This is a game changer! And you need to know this. I’ll show you how it worked on my own example with writing this book. As I was working on this book, sometimes I struggled to start writing. But once I start, I can easily write for hours. That’s how it works for me. The problem is that, on some days, I don’t want to start writing. So I won’t. I’m pretty sure you experienced something similar, even with different activity. The key to forming a habit, is the consistency. So I decided to create a new habit, and promise myself that no matter what, I’ll stick to it for the next 30 days. I promised myself to write 600 words every day for 30 days. Here’s what happened: for the first couple of days I was motivated to stick to the plan. Then my motivation got lower (always does), so I used my willpower to keep going with the habit. However, after a two weeks or so, I missed a day. And once I missed one day, it’s was pretty easy to miss another. That’s the biggest problem with forming new habits. If you’re not consistent, you can’t create a habit. So I finally understood the problem. When you feel resistance to something, you won’t do it. If you don’t feel like start with writing (like me in the above example), motivation and willpower can’t really help for the long-term. With mini habits, you make a workaround for this resistance. And when there’s no resistance, you just start and do what you should. Back to the previous example: 600 words a day doesn’t seem like much. And it’s not in the beginning. But after a week or two, as I started to lose motivation, it’s becoming harder. To solve this problem, instead of making a commitment to write 600 words a day, I’ve made a commitment to write just 50 words a day. One paragraph or one Vim tip. When you do this, you’ll notice that there’s absolutely no resistance whatsoever. I know I didn’t feel resistance to write only 50 words. Even if I was having a bad day – I was still able to find a couple of minutes and write the damn 50 words! Anyone can do that. Actually, I realized that it was easier to write those 50 words, than it is NOT to write them. Why? Because if you make a commitment, and no matter how good or bad you feel, you can’t motivate yourself to write the damn 50 words, then you’re basically saying yourself that you’re a big loser. Your pride won’t let you fail at something so ridiculously small. Especially if it takes less than two minutes to complete. This was a game changer for me. You might think: “Yeah, but there’s nothing you can achieve with writing 50 words per day…”. Well, that’s absolutely wrong. How so? You can try it. Sit down to write 50 words. Or trust me. When I would start with writing (with 50 written words goal in mind), I would usually write far more than 50 words. Because once I would start, it was difficult to stop. And this is the real power I wanted to share with you. No matter how you feel. No matter how busy you are. It’s very hard to fail with such a tiny commitment you’re after. So, the whole trick for me was to make a commitment to write just 50 words every day. Your commitment could be learning Vim quickly. That’s why you must always go in with the intention to complete the smallest possible step. If you make it bigger, you will start to feel resistance. Now, let’s get back to Vim. This book is carefully structured, so you can get knowledge from it step by step. Don’t make a goal to read 3 chapters of it today. Don’t make that mistake. Instead, read a page or two. And then go practice what you’ve learned. Don’t forget. Habits require consistency. That’s how you’ll master Vim quickly. You can’t master any skill in one day. You have to improve a little every singe day. It compounds. That’s the how you should approach to learning Vim as well. Every day matters. You either increase your skill level for 1% or decrease it. It’s your choice. In the beginning, there’s no really difference between making a choice that is 1% better or 1% worse. It won’t impact you today. But over time these small choices compound. When 1% compounds every day, it doubles every 72 days. If you commit to improve your Vim skills 1% every day, in one year your skills will be 38 times better! How do you know how much is 1%? Well, when it’s about Vim, it’s hard to measure it. I would suggest that you decide what your 1% is doing to be. It can be reading one page of this book. Or learning one new Vim feature, command or trick. Another way is to dedicate a fixed time for learning Vim every day. Let’s say that you dedicate 20 minutes every day to learning Vim. During those 20 minutes, you’ll improve your Vim skills – sometimes by 1%, sometimes by less or more. It’s not so much important to be that precise. What’s the most important here is consistency. Keep improving you skills every single day. Don’t worry if you’re a complete beginner. I don’t assume that you’re already good in Vim (but this book will still be very useful if you are!). You’ll find the information in this book more valuable and practical than anything you learned from other Vim resources. Each chapter is packed with examples that support detailed explanations of all the important concepts, and they are presented in a way that helps you avoid the confusion that I faced when I was learning. With this book and plenty of practice, you will be amazed at how quickly you can go from complete beginner to super productive pro. Mastering Vim Quickly is for anyone who wants to learn Vim, but either doesn’t know where to start. For anyone who has tried to learn it, but struggled to make progress, or was intimidated by how difficult Vim appears to be. This book is designed to give you the head start I didn’t have. Wherever you are, if you want to learn Vim, the book will help you learn it faster and easier. Start exploring Vim today, and have fun! If you want to get notified when I publish the book or get more content from the book for free, leave me your email below, and I’ll make sure to keep you updated. 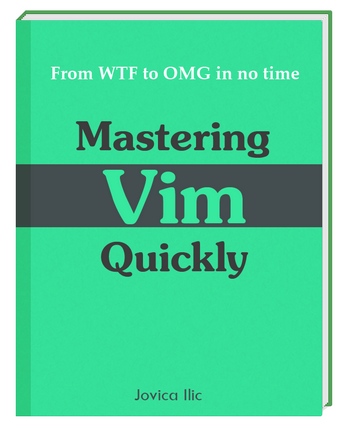 You could also go to Mastering Vim Quickly page and check it out.